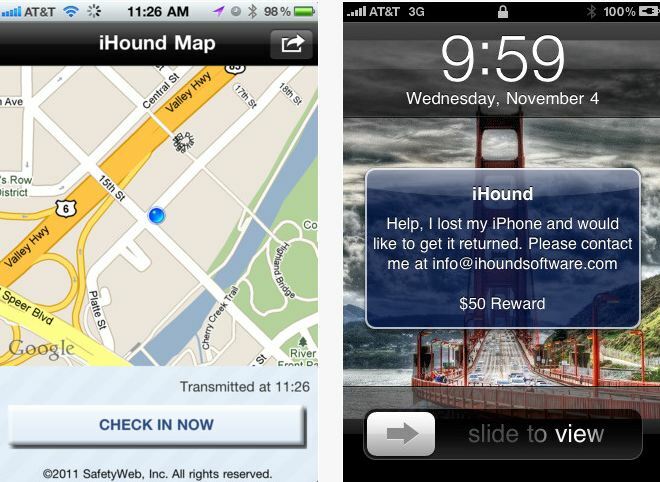 iHound app available for both iPhone and iPad devices, which helps the users to track and recover lost/stolen iPhone and iPad easily. The iHound app has lots of feature and also available for the android users. The app uses real time GPS and WIFI signals built into your devices to determine its location and helps you track your lost device. The best part of the app is it runs in the background, optimized to track your device without draining much battery. All you have to do is install the app from App store and registered a account on the iHound Website to use all the features from the computer. Once you are registered with them, you can find your phone any time, all of the time! So next time when you lost your iPhone, you simply sign into the iHound site to see its last transmitted location on a map. With the help of the app you can track your device last location, also send a push notification with a custom message and even a spoken alert. Also it has remotely activate a siren feature, which allows you to find a misplaced phone and the siren can be deactivated only from the site. The app has also one more feature tracking, With this feature you can track your family members where they are, when your child arrives at school, or when your spouse arrives at the grocery store, So with this feature you can always know where your family is all the time. The app is the best and effective way to recover your lost or stolen iPhone, iPad. And best to track you family members easily. So install the app today on your device and enjoy the feature for the iHound App.